twenty acres of land comprising a well improved and equipped stock and grain farm. In May, 1909, he retired from the farm and came to Merna to live, purchasing the comfortable, modern residence the family now occupy. He is known to be the friend of progress along all lines and is well regarded by his many friends and acquaintances. Ten children have been born to Mr. Walsh and wife, of whom the following account may be given: Mary, wife of Dr. J. H. Morrow, of Merna, has five children; Anastasia, of Omaha; Elizabeth is a nun in a convent at Sinsinawa, Wisconsin; Anna, is the wife of M. S. Quinn, of Colorado, and they have seven children; John J., lives in Sioux county, Nebraska; Kathryn, is a teacher and lives at home; Loretta and Margaret are in Omaha, where the latter is a student; two sons died in infancy. The gentleman above named resides on section thirty-three, township twenty-six, range two, in Pierce county, where he owns an interest in seven hundred and eighty acres of well improved land, some of which is a beautiful grove of trees. Our subject was born in 1876, and came to Pierce county with his parents when but a boy of six years old. Mr. Havel's father, Mathious Havel, was born in Bohemia, in 1837, and served in the army of his native country for twelve years in the war between Prussia and Austria in 1866, and also in the war between France, and Germany. He came to America in 1872, and lived in Wisconsin a short time, and from there went to Omaha, and subsequently settled in Saunders county, where he took up a homestead and where the family endured many hardships and privations, is did most of the early settlers on the frontier. Our subject's father first built a house of adobe, which is a mixture of mud and hay. The family experienced many severe losses through failures of crops on account of drouths and hail, and during the blizzards of 1873 and 1888 had to burn hay to keep warm, and lost some cattle. All the crops were lost in the grasshopper raids for two seasons; then he finally bought a tree claim in Pierce county, from C. C. Ranch. which has developed into the present beautiful home of the two sons, John and M. M. Havel. John Havel the subject of this sketch was married in 1897 to Miss Mary Silhaeck, whose parents emigrated from Bohemia to America about 1890. Mr. and Mrs. Havel have a fine family of four children, who are named as follows: Mary, Anna, Rosa and Emma. Mr. Havel is a member of the Modern Woodmen and is also affiliated with the Z. C. B. J. He is independent in politics, voting for the best mail. The gentleman herein named is well known by residents of Merrick county, Nebraska, as one of the leading old settlers of his locality, and a man who has done his full share in the upbuilding of the agricultural and other interests of his community. Mr. Boelts, in partnership with his brother, S. G. Boelts, and two sisters resides in section three, township thirteen, range eight, which is his home place, where he has a fine home and valuable estate, and enjoys the esteem and respect of his fellowmen. John G. Boelts, son of Gerd and Anna (Oeltjen) Boelts, was born December 31, 1873, at Oldenburg, Germany, and was sixth in a family of eight children, two of whom are deceased. He has two brothers and two sisters in Merrick county, Nebraska, and one sister in Denver, Colorado. Mr. Boelts came to America in September of 1878, with his parents who located in Merrick county, Nebraska, engaging in farming. In 1908, Mr. Boelts was elected to the lower house of the thirty-first Nebraska state legislature. His term of office expired January 1, 1911. He has also served on board of his school district number thirty-five, for four years; and as justice of peace and township treasurer. Mr. Boelts in partnership with his brother, S. G. Boelts and sisters own seven hundred and sixty acres of fine farm land in township thirteen, range eight. It is a splendid stock farm and they make a specialty of Hereford cattle. Mr. Boelts is a young man of good attainments, standing for progression, and an uplifting of state and county. He is an active intelligent man who keeps abreast of the time and is conversant with all affairs of public interest. John G. Boelts' father, Gerd Boelts, died May 9, 1898. He located where the present buildings are situated when he first came to Nebraska and this was his home during the balance of his life. He added to the original farm until at the time of his death he owned four hundred and forty acres. His widow, Mrs. Anna Boelts, survives him and makes her home with her children. To Mr. and Mrs. Gerd Boelts the following children were born: Kate, wife of G. Pfleiderer, Johanne; Frederick G., John G., S. Gustav and Anna L., besides two who died in infancy before the family came to the United States. All the children were born in Germany except Anna L.
others less fortunate. There were Indian scares, and after the celebrated battle of Wounded Knee, the settlers felt much uneasiness, trying to keep together as much as possible, several families occupying one cabin so as to be better protected in case of attack by the redskins. Mr. Bradstreet was well acquainted with Kid Wade, one of the early rustlers of whom so much has been written. He started out from the vicinity of Holt and Knox counties, and for several years his name was a terror to the settlers throughout that part of the state. Those days are now long since passed, though not forgotten, and while they were hard ones at the time, the memory is not unpleasant, showing with what fortitude the pioneers met the problems that confronted them. Mr. Bradstreet was born in Ulster county, New York, on May 15, 1863, and is a son of Henry M. and Susan (Robinson) Bradstreet, the former's death occurring in Spencer in 1908, while the mother now resides with a son there, and enjoys good health and the society of many friends. After coming to Nebraska, Mr. Bradstreet remained with his parents for about three years, then started for himself, filing on a homestead in Holt county, which he farmed for about twenty years. In 1905 he settled in Lynch, opened a livery barn and carried on the business for four years, when he was elected to the office of sheriff. Prior to his election, he had served as deputy for four years, thus being thoroughly familiar with the duties of the position and knowing every person and part of the county. He was installed in office on the 7th of January, 1910, and begins his term under the most favorable auspices, having the complete confidence of the people, who know him to be a man of untiring energy and faithfulness to his charge. Politically Mr. Bradstreet is a democrat, and while Boyd county is normally republican he won his recent election by a comfortable majority over his opponent. Mr. Bradstreet was married in O'Neill, on December 15, 1886, taking as his wife Miss Nettie Hubby, daughter of John Hubby, of Lynch, of whom an extended sketch is to be found in this work. Their marriage was performed by Judge Gillispie, and was one of the well remembered events of the season, both being members of the foremost pioneer families of Nebraska. Three children have been born to our subject and his esteemed wife, as follows: Howard E., Ethel and Nellie. Mr. Bradstreet is a member of the Lynch lodge number two hundred and fifty-five, Independent Order of Odd Fellows, and of the Masonic lodge, number ninety-five, at O'Neill. The above gentleman, who is now deceased, was for many years a leading citizen of Boone county, he was a well known pioneer, a man of fine character, taking at all times a prominent part in any work which tended to the upbuilding of the locality and best interests of his county and state. Alonzo Brooks was born in New York state on January 25, 1829, grew to manhood there, and was married October 1, 1851, to Miss Mary J. Wilson, three children being born of this union. The family settled in Washington, D. C., in 1852, remained for two years, then came west, locating in Boone county, Illinois. In 1862 Mr. Brooks enlisted in Company K, Ninety-fifth Volunteer Infantry of Illinois, and did splendid work for his country, being promoted from second to first lieutenant of his company on July 10, 1863. He took part in many famous battles, and was with his company in continuous service from the time of enlistment up to the date of his discharge, being mustered out at the close of the war, in 1865. In the fall of 1872 Mr. Brooks came to Boone county, Nebraska, took up a homestead and was joined by his family the following year. He at once engaged in the farming and stock raising business, continuing up to 1885, at which time he moved to the village of St. Edwards and lived there for about four years. At this time, himself and family. with the exception of one son, Horace, moved to Homeland, Florida, and there his death occurred on May 3, 1901. He was survived by his wife, son Horace, and a daughter, Sarah. Mr. Brooks was a man of fine character, and was at all times prominent in every work which stood for the upbuilding of mankind and the good of his community. He was successful in every respect and was a truly self-made man, enjoying the esteem and love of all with whom he came in contact. George H. Hanks, a prominent farmer and stockman living on section four, township twenty-eight, range five, Antelope county, Nebraska, is well known throughout this section as a progressive and successful agriculturalist, highly esteemed by all with whom he has had to do. Mr. Hanks is a son of George and Kate (Kane) Hanks. Our subject's father was born in the year 1834 in England, and was a British soldier, and was stationed at Montreal, Canada, for four years. The mother came to Canada when she was a small girl, from Ireland. Our subject, Mr. Hanks, is a native of New York, and went to Vermont when he was five years old, with his parents, and from thence removed to Illinois in 1868, when in the year of 1870 the family migrated to the state of Iowa. range, five, which is his present location, as before stated. Mr. Hanks has one hundred and sixty acres of land in this section, and one hundred and twenty acres of land in Knox county, five acres of which are given to trees. Mr. Hanks was joined in holy wedlock in the year 1876 to Miss Emily C. Barnes, and they have one child, R. B., who is married to Miss Hilsinger, who also have one child. Mr. Hanks is affiliated with the Masonic, Woodmen of the World, and Workmen lodges, and has assisted materially through his labors and example in the upbuilding of the farming interests of his community, well meriting his high standing as a worthy citizen. Andrew J. Thompson has been a resident of Custer county several years and has lived in the state much of the time since 1884. He is well known in his community as a prosperous and successful farmer and a substantial, progressive citizen. He was born in Peoria county, Illinois, July 17, 1857, third in the family of seven children born to James and Caroline (Vandevere) Thompson. Of these children, Daniel, James, Andrew, Ida (Mrs. Sturm), and Emma (Mrs. Williams), live in Nebraska, and two daughters live in Illinois. The parents were born in Indiana, the mother of English parentage. They located in Dodge county, Nebraska, in 1885, and both died in Keya Paha county, Nebraska, the father in 1908 and the mother in 1907. In youth Mr. Thompson attended the schools near his father's home on the Illinois farm, and upon reaching young manhood engaged in farming. He was married in Peoria county, February 21, 1882, to Miss Vina Sturm, who was born in Clayton county, Iowa, daughter of Lewis and Harriet (Robinson) Sturm, natives of Indiana, the father of German extraction. Both parents died in Iowa, the father about 1866 and the mother about 1887. Mrs. Thompson has one brother, George, in Lincoln; a brother in Mitchell, South Dakota; a sister in Portland, Oregon; three brothers in Portland; one sister in Clinton, Iowa; one sister in Wisconsin. Mr. and Mrs. Thompson lived on the Illinois farm until the spring of 1884, then came with their young son to Richardson county, Nebraska, and engaged in farming there. In 1890 they went to Kansas and pre-empted one hundred and sixty acres of land in Lane county. After proving his title to this they returned to Richardson county, Nebraska, and remained there until 1904, and since that time have been residents of Custer county. Mr. Thompson had purchased, some time before 1904, one hundred and sixty acres of land on section nine, township eighteen, range eighteen, which is still the home place. He has since purchased the west half of section fifteen, township eighteen, range eighteen, adjoining, making a farm that is well adapted for stock raising and grain farming. Mr. Thompson is a man of influence in the community and is interested in local affairs. During the years he has been a resident of Custer county, he has served as director of the school board of district number forty-nine. He and his wife have five children: Albert L., married and living in Custer county; Lester, also of Custer county, has two children; Charles, Eva and Hazel, at home. Among the adopted sons of Valley county, Nebraska, perhaps there are none who are better known than the Koll brothers, who are prosperous farmers living on adjoining farms near Ord. Claus J. Koll, born in the village of Ehlersdorf, province of Holstein, Germany, on the 16th of June, 1856, was the eldest of three children born to Hartwig and Margarita (Kuehl) Koll. Mr. Koll spent his childhood and early manhood years in his native country, not coming to America until 1884, after the death of his parents. He sailed from Hamburg in the "Ritzia," and after eighteen days landed in New York. He first came to Dodge county, Nebraska, where he was employed at farm labor until 1889. At that time he came to Valley county, and after working for a year on a farm, purchased the northwest quarter of section five, township eighteen, range fourteen. He has since purchased adjoining land, and the farm now comprises two hundred and forty acres. At the time of purchase it was unimproved, but since his possession, Mr. Koll has set out a fine orchard, good, substantial buildings have been added, and the place is now regarded as one of the finest in Valley county. We are pleased to note that an excellent view of their farm home is to be found on another page of this work. On June 19, 1892, Mr. Koll was married to Emilie Prien, who is a native of Davenport, Iowa, and daughter of John and Augustina (Wagoner) Prien. They came to America in 1857, embarking at Bremen for Baltimore in a sailship, and were nine weeks on the voyage. Three children, Hartwig, Henrietta and John, have been born to Mr. and Mrs. Koll. 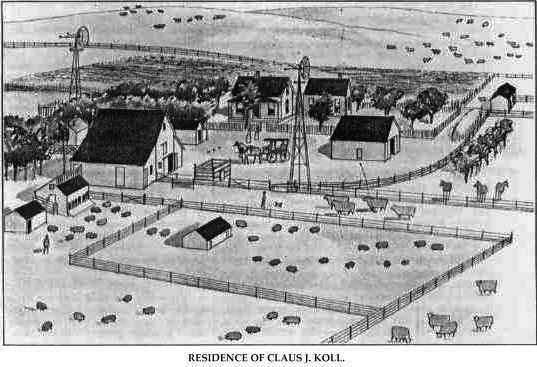 Hartwig Koll joined his brother Claus in Dodge county in 1887, and was married there to Dorothea Hass a few years later. In 1903 he followed his brother to Valley county, and, now lives on his farm, which is a little southwest of that of Claus. Four children have been born to them, Anna, Rosa, Frida and Edna. been the case in the old world. They are, both of them, self-made men in the strictest sense of the word. All that they possess has come to them only as the result of work and the exercise of economy and good judgment. In 1890 hail destroyed their crops and during the year of drouth, 1894, nothing came to harvest, but with all the discouragements, success has at last attended their efforts. Both families are well and favorably known and have the respect and esteem of a large number of friends. They were reared in the Lutheran faith, and in politics are independent of party lines, voting for the man best fitted for the office. Residence of Claus J. Koll. Joseph Bryan, formerly a prominent farmer of Custer county, Nebraska, was well known for the prominent part he took in advancing the educational, religious and material advancement of his part of the county. Mr. Bryan had a wide circle of friends and his loss was deplored by the entire community. He was born in Missouri, March 29, 1846, a son of William and Caroline (Brinn) Bryan, and the oldest of their six children. He has one brother, John W., in Custer county, a sister in California and one brother and one sister in Illinois. His father was of English descent, served in the civil war, and was killed at the battle of Shiloh. His mother, who was of English and Scotch descent, died in Illinois. While Joseph was still a very young boy, his father moved to Clay county, Illinois, and when but seventeen years of age, he enlisted in Company K, Forty-eighth Illinois Infantry, serving about two and one-half or three years. At the close of the war he returned to Illinois and engaged in farming. Mr. Bryan was married on September 16, 1869, at Taylorville, Illinois, to Mary E. Baker, who was born near Olney, Richland county, Illinois, a daughter of William and Caroline (Utterback) Baker, the former of whom died in Illinois in 1861, and the latter in Custer county. in 1895. Mrs. Bryan has two sisters in California, one brother and one sister in the state of Washington; one brother in Illinois; one brother, James Baker, at Mitchell Nebraska; one brother in Missouri; one sister, Mrs. Sarah Carroll, died in Custer county, February 7, 1911. In the fall of 1873 Mr. Bryan brought his wife and two children to Lincoln, Nebraska, where for seven years he was employed in the salt works. In the fall of 1879 he moved to Custer county, living with his brother, John Bryan, until spring, when he erected a residence on his homestead, having filed on one hundred and sixty acres of land comprising the southwest quarter of section twenty-six, township sixteen, range seventeen. In the spring of 1880, the day he moved onto the place, he planted an elm by his door as a memorial of the occasion and gave directions that it be ever preserved. It is now one of the finest of the many large trees on the place and holds a conspicuous place in the view of the home and surroundings which we are pleased to publish on another page. This remained his home until the time of his death, November 29, 1892, after fifteen years of invalidism. He was survived by his wife and the following seven children: William B., married and living in Kansas, has two children; Isabelle, wife of J. T. Wood, of Mason City, Nebraska, where he is a stockholder and cashier of the Farmers' Bank, they have four children; Jeanette, wife of Grant Stevens, of Kansas, has three children; Alice, married Luther Wilcox, of Montana, and has two children; Frank G., of Lincoln, is married and has two children; J. Harry, married and living in Custer county, has two children; Robert L., has remained at home with his mother with whom he runs the farm, having purchased the interest of the other heirs. Mr. Bryan was instrumental in organizing school district number one hundred and thirty-two and served a number of years on its board. He and his wife were largely instrumental in organizing one of the first Sunday schools in the county. After Mr. Bryan's death his widow continued to reside on the home farm, and with the assistance of her son Frank, carried on the place and paid off the mortgage. She devoted her attention to the care and rearing of her large family of children and proved herself an excellent business manager. The place is a productive tract, Mrs. Bryan being a frequent exhibitor at the county fair. In 1911 she and Robert secured twelve first and six second premiums on the home place, which is a well improved stock and grain farm. Fruits, vegetables, jellies, honey and other products, including one sweepstake prize. 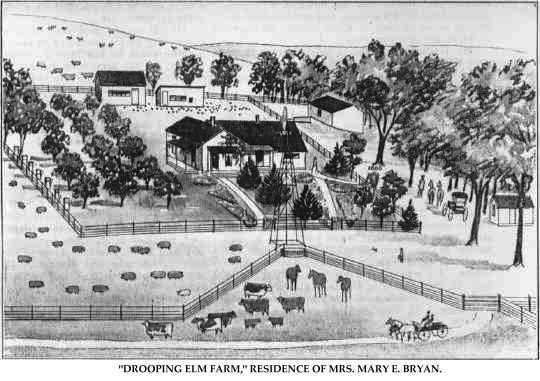 "Drooping Elm Farm," Residence of Mrs. Mary E. Bryan. Joseph Forsyth, a faithful servant of Uncle Sam, is a popular and esteemed citizen of Pierce, Nebraska. He has been engaged in the mail service since June 1, 1904, and during that time has become familiar to the entire community through which his work carries him, in the regular performance of his duty gaining the confidence and respect of all with whom he has met. getting as pay his board and clothes. About 1850 his family moved to DuPuyster, St. Lawrence county, New York, leaving him in Cornwall, and he could only communicate with his parents through his employer, who kept him in ignorance of the place to which they had moved in New York state, but, by watching his chance when the former was away, he secured one of his father's letters, found that his time was nearly out, so ran away. Taking an unpaid passage up the St. Lawrence river to Prescott, which was near where his parents had located, he made the entire trip without paying anything for fare. Arriving at his father's home safely, he soon found out that his former employer was coming after him to take him back and finish his term of apprenticeship. To escape this, he ran away from home and hired out to a Mr. Lamberson, a drover who was passing with a herd of Canadian ponies, worked for that gentleman a year, for eight dollars a month and his board. He was located in Herkimer county, and after being there a few months, wrote his father of his whereabouts. Learning of his mother's illness, he returned home and remained until after her death. Afterwards settling near his father's place, he was married there in 1861. In the same year he felt the impulse of patriotism and enlisted in Company D, One Hundred and Eighty-sixth New York Volunteers. In January, 1865, while with his regiment in Petersburg, he received the greatest shock of his life, a letter from Captain Day, sent from Washington, D. C., informing him of the destruction by fire of his father's house, in which his father, step-mother, her parents, his sister, and his baby perished. This news almost drove him to insanity, but so many furloughs were being granted that the order had gone out that no more were to be given. Friends took the matter up with General Griffin, who recommended a thirty day leave of absence, and the order was signed by General Grant for his transportation. He departed with a sad heart having the good wishes and sympathy of his comrades, his trip taking him through Washington, and while waiting for his train out, passed by the White House. President Lincoln was outside of the building, and ordered the guard to admit Mr. Forsyth, the latter telling him of his trouble, and the kindhearted president was very sympathetic, showing him through the building, and on his departing gave him his blessing. On his arrival home, he found conditions so deplorable that he overstayed his time returning, to his company four days late but his superiors were very kind and he was not even reprimanded. He was in the battle of Petersburg, April 2, 1865, there receiving wounds which disabled him, and he was taken to the hospital, where hasty attention was given him. Then he was sent with others to the Washington military hospital. His wound had become gangrenous and as the hospital was full to overflowing he was sent on to the hospital at Philadelphia, there proper attention being given him and he recovered after weeks of suffering. He received honorable discharge on July 21, 1865, and he immediately returned home. Mr. Forsyth conducted his farm up to 1879, then sold out and came to Nebraska, taking up a homestead in Pierce county, and resided on it for eighteen years, his wife's death occurring there in January, 1897, and afterwards he settled in town. He remarried and rented a farm near town, carrying it on up to 1903, then sold everything and settled in Pierce, and since June of the following year has held the position of mail carrier on rural route number three. Mr. Forsyth had six children by his first marriage, five of whom survive, namely: Nina, Mary Jane, Frances, Cassie and Robert, all of whom are married and well situated in life. His second wife was Mrs. Mary Bell Johnson, widow of Louis Johnson, and of their union there were two children, Dewey and Lucy, both of whom are now pupils in the Pierce schools. Mr. Forsyth is a republican; his first vote was cast for Douglas, to please his father and against his own inclinations, but since that time he has supported the republican party in every campaign. He is commander of Pierce post number one hundred and ninety one, Grand Army of the Republic, and with his family is at liberal contributor and active member of the Methodist Episcopal church. The gentleman above named is well known as one of the leading citizens and business men of Farwell, Nebraska, where his ability and sterling character has long been recognized. He is now in the prime of life, active and vigorous, and bids fair to have his name enrolled as among the foremost men of his time in the history of that region. He is at the present time cashier and active manager of the Farwell State Bank, of which he was one of the organizers on its establishment in February, 1903. August C. Wichman is a native of Dane county, Wisconsin, born July 18, 1867. His early childhood was spent in that state, coming to Howard county, Nebraska, with his parents, four brothers and a sister, in 1873, where his father had previously filed on a homestead. August was the youngest in the family, and his early education was received here, living at home until his twenty-second year, when he began farming on his own account, locating on section twenty-two, township fourteen, range twelve, which became. his home place after he had acquired considerable land in Howard county and the adjoining counties. He was extensively engaged in farming and stock raising for ten years, meeting with signal success in both lines of the work. organizers of the Farwell State Bank, started in that year, the others being C. C. Hansen, president, and T. J. Hansen, vice president, while our subject was appointed to the position he still occupies as mentioned at the head of this sketch. This bank is one of the solid and growing institutions of the vicinity, and has a large clientage from the entire country tributary to Farwell. Besides his connection with this business Mr. Wichman has other large interests, particularly in the Ashton State Bank in Sherman county, and the general mercantile business at Cotesfield, Nebraska. Mr. Wichman is in active and progressive man in financial affairs in his locality, using his influence and money in every way possible to further the best interests of his community. He has formerly been chairman of the village board. Mr. Wichman was married to Miss Carrie Obermiller at the home of her parents on the Obermiller homestead, February 20, 1894. She is a daughter of an old pioneer family of Howard county, and is a lady of most charming manner and accomplishment. Mr. and Mrs. Wichman have five children living, all at home, named as follows: Sophia, Hattie, Sidney H., Frederick J. and Wilbur O.
Franz Onkes Franzen, living on section eleven, township seventeen, range sixteen, Valley county, Nebraska, was one of the earliest settlers of his part of the county and has lived on this farm since May, 1883. He was born in Hanover, Germany, April 19, 1846, the fourth in a family of four sons and two daughters born to Onka and Jantje (Fanders) Franzen. he was reared on a farm and educated in the parochial schools, and in 1871 came to America. Prior to coming to America, Mr. Franzen had been a sailor from the spring of 1860 to the fall of 1871, and during that time made several voyages to the East Indies by way of Cape of Good Hope, and to South America. The ship on which he was signed changed captains at Liverpool, and Mr. Franzen took advantage of his right to claim a discharge, after which he embarked there for Quebec on a Cunard liner and came thence to the United States. After working for a few weeks at Minier, Illinois, he came on to Nebraska and made settlement in Cass county, September 2, of that year and his first employment was as a farm hand, working in the big orchard of Perry Walker near Plattsmouth. Later he was able to engage in farming on his own account on rented land in Cass county, and chose Nebraska as a permanent home for the reason that he was able to secure good land there at small expense. Mr. Franzen was married November 13, 1874, to Gretje Bonnen, who had arrived in Nebraska from Germany during that year. She was one of the seven children of George and Renska Bonnen. Mr. Bonnen died in Germany in 1875, and his widow and one son came to Nebraska in 1881. Her death occurred in Cherry county, Nebraska, when she was in her eightieth year. Mr. Franzen brought his wife and three children to their present home in May, 1883, securing as a homestead the northwest quarter of the section. He has improved and developed the land until he now has a very pleasant home and a productive farm. He and his wife have had six children, of whom three survive, namely: Onke, Renske and George, all born in Cass county. The three who were born since they came to Valley county are deceased. The family passed through the severe trials of early pioneer life and their success is well earned. In politics Mr. Franzen is independent of party lines and votes for the man he believes to be best fitted for the place. Herman Charles Sattler, residing in Norfolk, Madison county, is one of the oldest settlers in northeastern Nebraska, and by his efforts has aided materially in the development of the agricultural and commercial resources of his county. Mr. Sattler is a gentleman of most excellent character, and is highly respected in the community in which he resides. Mr. Sattler was born in Chicago, Illinois, November 16, 1861, and was the fourth of six children in the family of George William and Catherine Elizabeth Sattler, who had four boys and two girls; but two of the children died prior to our subject's birth. The father was born in Hanover, Germany, and the mother in Baltimore, Maryland, where she died in January, 1906, survived by her husband, who died April 30, 1911, three sons and one daughter: Augustus, who was formerly an attorney in Norfolk, Nebraska; Herman, William R. and Emma. Herman Charles Sattler from his second year made Baltimore, Maryland, his home until 1877, in that year going to Amherst, (Massachusetts) College, where he remained three years; when he went to Mexico on a railroad survey for one year; then returned to Baltimore about a year, where he was manager of the Garrett farms. He then came west, spending some months in Chicago; then in Colorado, coming to Pierce county, Nebraska, in the spring of 1883, when he purchased eight hundred acres of land which he used for farming and stock raising ten years. He came to Norfolk, Nebraska, in February, 1892, with small capital, but a goodly supply of energy and ability, becoming connected with the Norfolk Trading Company, and in the following year purchased the Rudat Implement business and has remained continuously in the implement business until this date, enjoying a large and extensive patronage. He is also engaged in the purchase and sale of horses and cattle, and has large land interests. and business circles to his own untiring energies. He is a prominent man in business circles, and is always interested in the upbuilding of his home county and state. Mr. Sattler was married in Baltimore, Maryland, February 2, 1888, to Miss Loulie Johnson, who died in Norfolk, Nebraska, April 7, 1893, survived by her husband and two sons: George William, junior, now connected with the Omaha National Bank; and Augustus Edmund, attending Johns Hopkins University. Mr. Sattler was again married in April, 1900, at Norfolk, Nebraska, to Annie Carton of O'Neill, Holt county, Nebraska, whose father and family were of old pioneer Nebraska stock, originally of New York state. Two children were born of this union: Edmund Herman and Loulie Annie. Mr. and Mrs. Sattler and family occupy a pleasant modern Norfolk home, and have many friends. Mr. Sattler is a democrat. Benjamin F. Cox, a progressive and enterprising stock and grain farmer of Custer county, is interested in various business ventures in the county and is generally respected as a man of good business principles and character. He was born in Jackson county, Indiana, August 16, 1856, fourth in the family of seven children born to Jabez J. and Margaret (Hubbard) Cox, natives, respectively, of Kentucky and Indiana. The father was a soldier in the Mexican war and both parents died in Indiana. Besides Benjamin F., others of the children now surviving are: Henry, of Custer county; Adelbert, in Perkins county, Nebraska; and one daughter in Indiana. Mr. Cox received the usual educational. advantages accorded a farmer's son in Indiana country schools, and in 1875, when he was nineteen years of age, went to Iowa, working at farming in several counties in that state. In the fall of 1882 he came to Hamilton county, Nebraska, and in the fall of 1883 came to Custer county and took up a homestead of one hundred and sixty acres of land on section eight, township seventeen, range twenty-two, and a timber claim of one hundred and sixty acres of land adjoining on the east. This was the home place many years, and on February 22, 1891, was married to Christina Kaupp, a native of Illinois, who came with her parents to Custer county in an early day. The Kaupp family have been prominent in the development and upbuilding of Custer county. Eight children have been born to Mr. and Mrs. Cox, as follows: Lloyd William, Della A., Chester V., Hazel R., Ralph, Benjamin F., junior, Gladys I. and Margaret, all at home. Mr. Cox is one of the earlier settlers of his part of the county and has prospered with the development of the region. He became successful in his agricultural operations through ambition and energy and in his home farm of eight hundred acres has a fine, well equipped estate, well adapted for stock and grain farming. He owns some fourteen hundred and forty acres of land, including the home farm, and is interested in the farmers' elevator at Merna, of which he is a director. He was one of the organizers of the Farmers' State Bank of Merna, and is its president. He helped organize school district number one hundred and fifty-two, serving on its board several years. He is an intelligent and progressive citizen and has a wide circle of friends in Custer county, where he has lived nearly thirty years. For over twenty-seven years, the gentleman above named has been closely identified with the agricultural interests of Wayne county, Nebraska, and he has aided materially in transforming this locality from its wild, natural state into a thriving farming and commercial district. He is a gentleman of great perseverance and energy, and has met with deserved success in his labors. Mr. James is a native of Oneida county, New York state, and was born July 27, 1845. His parents, William and Mary James, were natives of Wales, who came over to America at a very early date. Mr. James spent the years of his childhood in New York state, and also went to the schools there. In 1875, Mr. James decided to come to the west, following Horace Greeley's advice; and so, with his wife and family, came to Iowa. However, although they remained there until 1884, they were not entirely satisfied with their location. In that year they came to Wayne county, and bought their present home in section fourteen, township twenty-six, range one, east, where they still reside. They decided that this should be their future residence, and with characteristic energy Mr. James at once proceeded to make one improvement after another on the farm, as the times permitted, until now it is a very valuable piece of property. Mr. James was married, in 1870, to Miss Jennie Jones, of Herkimer county, New York. Six children have been born to them, upon whom they have bestowed the following names: Ellen, Maine, Jennie, Fannie, William and Ward. Mr. James is one of the most prosperous and influential farmers of the community, and enjoys the respect of all with whom he has come in contact.